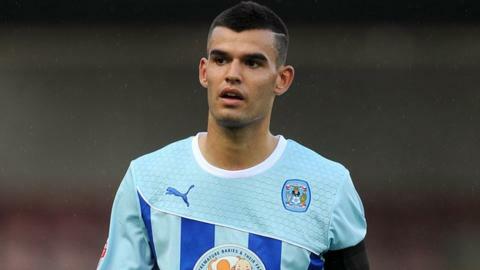 Coventry midfielder Conor Thomas could be good enough to play in the Premier League, predicts boss Steven Pressley. Thomas, 20, already has experience of a top-flight club, having gone out on loan to Liverpool shortly after making his first-team debut in January 2011. But, after not always proving an automatic choice for City, he has flourished since Pressley's arrival. "He's an outstanding young player. I think he can play at the very top in the Premier League," said Pressley. 8 Jan 2011 - Makes debut as second-half sub in 2-1 FA Cup win over Crystal Palace. 31 Jan 2011 - Signs for Liverpool on a half-season loan. 2011-12 - Makes 27 Coventry City league appearances under Andy Thorn. 2012-13 - Does not make a start under Mark Robins, but earns a late-season first-team recall under new manager Steven Pressley. 2013-14 - Ever-present in central midfield for the Sky Blues alongside John Fleck. After bringing him back into the starting line-up for two matches at the end of last season, Pressley has turned Coventry-born Thomas into an ever-present this term. And his efforts in steering the Sky Blues to the edge of the League One promotion zone have earned Thomas a new, improved contract - tying him to the club until June 2016. But for their 10-point pre-season penalty, the Sky Blues would be lying in fourth place. "Prior to myself arriving, a lot of people had spoken to me about Conor," Pressley told BBC Coventry & Warwickshire. "I could see his qualities in possession were very good. "But the one area of improvement was his understanding of the game out of possession and he's now one of our best players at that, the way he pressures and gets after a game and into the second phase. "The one thing the modern game requires is true athleticism. "Conor is six foot one, extremely powerful and quick. He can cover the ground really well, but he can also handle the ball. "He has a good understanding of the game and he's a good example off the pitch too. "Even on his days off this week, he's still been in working on his game."